Recent scientific studies conducted at universities in Hungary and Sweden have shown that on a zebra pattern, far less flies come from. This is unlike other colors and patterns. The way the light reflects the zebra s pattern shows that they are not attractive to flying and dazing. 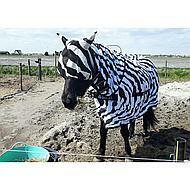 This discovery led to the introduction of the Buzz-Off Zebra, a black and white striped blanket and a suitable mask. 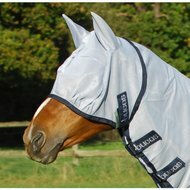 This way you can safely protect your horse from flying without having to use chemical means. 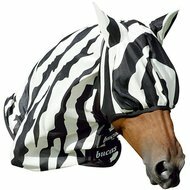 The Buzz-Off Zebra is made from a specially developed lightweight fine-grained fabric that even keeps the smallest insects. Blocks UV radiation. 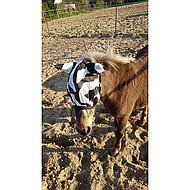 Loose mask with the ears covered, suitable for the Bucas Buzz-Off Zebra. Attach to the underside by Velcro. 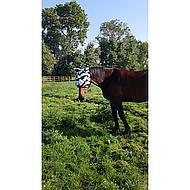 With pleats to create more space to create the eyes of the horse. 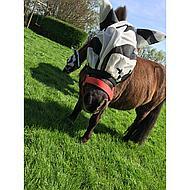 Works great and stays in place, it is difficult to fly in the hood.